Tri-Village graduate Danika Mann has transferred to Indiana University East and will play basketball for the Red Wolves after starting her college career at Ohio Christian University. 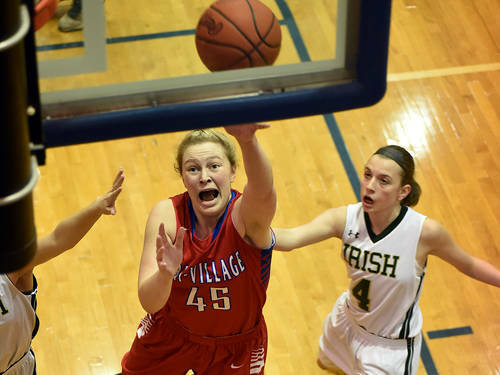 NEW MADISON – Tri-Village graduate Danika Mann transferred to Indiana University East and will play basketball for the Red Wolves’ women’s basketball program. Mann, the daughter of Christy and Robbie Hager and Rodney and Annette Mann, is a 2017 Tri-Village High School graduate. The 5-foot 11-inch forward played her freshman season of college basketball at Ohio Christian University. As a freshman, Mann played in 12 of Ohio Christian’s 28 games. She averaged 7.6 points and 3.8 rebounds in 17.2 minutes per game. Ohio Christian finished the 2017-18 season with a 7-21 overall record and a 1-16 mark in the River States Conference. The Trailblazers hired Brenda Baker as their head coach in May. She finished last season as the team’s interim head coach after Jamey Batten resigned midway through the season to pursue a new career opportunity. Mann will remain in the River States Conference as she transfers to IU East, which finished the 2017-18 season with a 22-11 overall record and a 13-4 mark in the conference. The Red Wolves made it to the first round of the NAIA Division II Women’s Basketball National Championship – their third consecutive appearance in the national tournament. Mann is one of eight players in IU East’s 2018 recruiting class along with Addie Brown from Talawanda; Niomi Dubé from Northrop in Fort Wayne, Indiana; Brionna Gray from Park in Wheeling, West Virginia; Destiny Jackson from Holy Name, Aliyssa Neal from Morgantown, West Virginia; Elizabeth Philpot from Birmingham-Southern College in Alabama; and Faith Sanderson from Wilmington. Mann enrolled at IU East for the 2018 spring semester and is an elementary education major. Kyle Shaner may be reached at 937-569-4312. Follow me on Twitter @KShanerAdvocate or get updates on Facebook by searching Darke County Sports or Advocate 360. For more features online go to dailyadvocate.com. This entry was tagged Basketball, CCC, College, Indiana University East, IU East, NAIA, New Madison, Ohio Christian, Ohio Christian University, Tri-Village. Bookmark the permalink.